The Palaung Women’s Organization have estimated that several thousand Palaung villagers from northern Shan state have been displaced in the protracted conflict between the Burma Army and local ethnic armed militia since early 2011 to now. 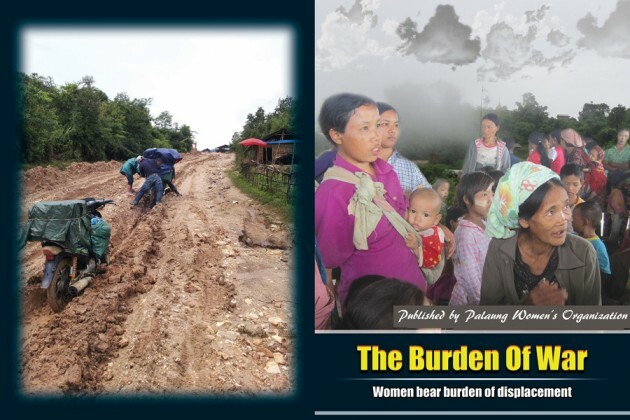 A report ‘The Burden of War’, released in early November by the PWO’s report claims thousands of civilians from 15 villages, are hiding in temporary shelters in the Manton and Nanhkan Township area in northern Shan state. The report says that women and children are suffering from being displaced and are in urgent need of foods, healthcare and basic housing material. Lway Poe Ngeal from the PWO who worked on report spoke to Karen News. The PWO report found that soldiers from the Burma Army have violated two Palaung women included only a 13 years old girl and executed 5 villagers. The report highlighted the need for emergency aid for the displaced people. “Living conditions are worst at the most remote IDP sites, in the mountains north of Manton, where little aid has reached over 500 IDPs. Mothers are struggling to feed their families on loans of rice from local villagers. Some have been driven to leave their children with relatives to seek work in China”. 16 battalions from the Burma Army are currently active in northern Shan State and are fighting with ethnic armed groups including the Kachin Independence Army, the Ta’ang National Liberation Army, and the Shan State Army-North. The PWO is calling for international pressure to be put on the Burma government to allow access to international NGOs and local NGOs to provide support to the displaced people.